Saturday afternoon, Sid’s Pub, Malacca. The old river meanders past the open veranda, the beer’s cold, three different open-air karaoke singers are battling it out in the tiny historical centre. There’s that special Malaysian olfactory cocktail of charcoal smoke, frying and a faint hint of drains. 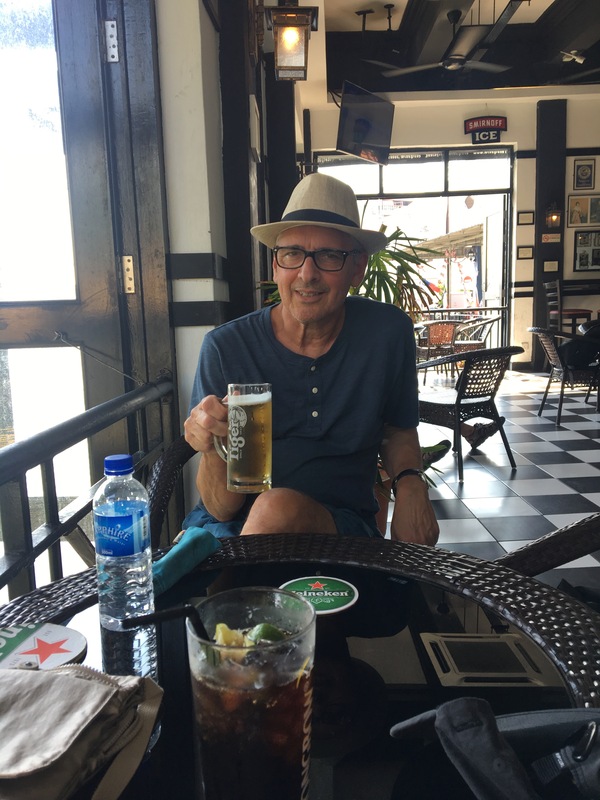 We’re here for a lazy holiday – a four-hour coach ride from Singapore and five days in the Casa Del Rio hotel, which I mistakenly thought was a grand old colonial establishment like Raffles or the E & O in Penang. Never mind that it was opened in 2008 – our room is a symphony of teak, grand plumbing, and vintage light fittings. The balcony overlooks the river, which snakes through old Malacca (let’s switch to Melaka), and makes this city faintly reminiscent of Strasbourg or Ljubljana – although much hotter! I’m also here to see a part of the world that featured in my academic research between 1996 and 2006*. My work centred on the way that Arabic vocabulary entered the Malay language around the 13th century, and Melaka featured as an important historic site. 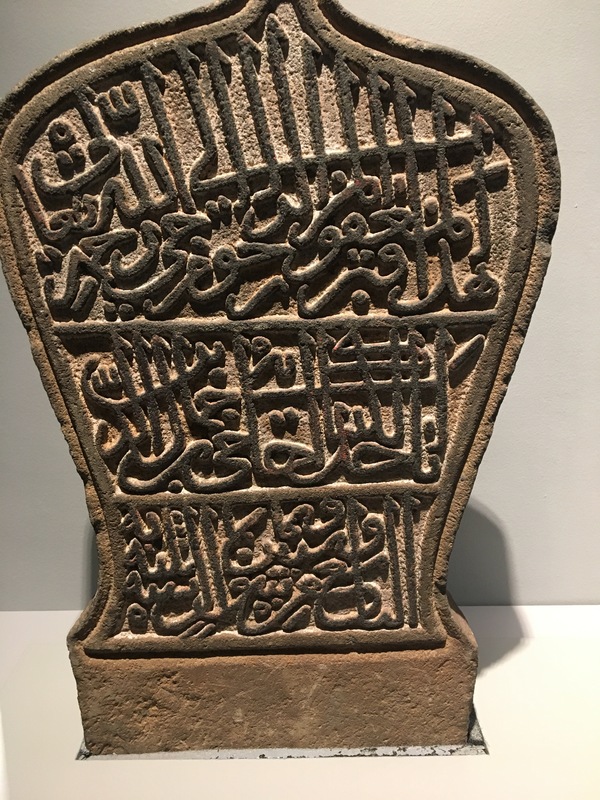 My plan was to see some Muslim gravestones that bore the first writing in Arabic script in the Malay world. I confess that the heat and langour of Melaka blunted my historical enthusiasm. In the evenings we drifted up and down Jonkers Walk, the main shopping street, with its amazing array of fried food and cheap gadgets. 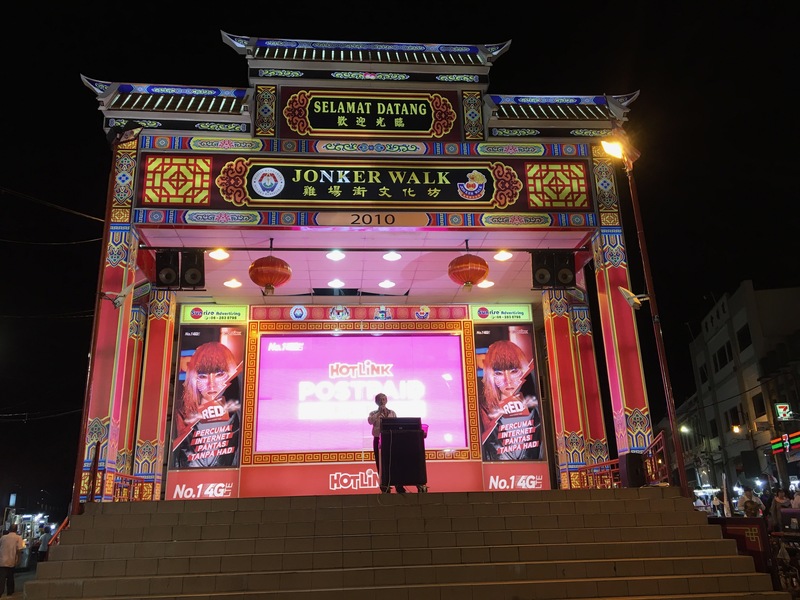 We sat to watch a Malay spruiker selling toilet gel dispensers to a crowd of tourists, and then wandered down to the Chinese karaoke stage. 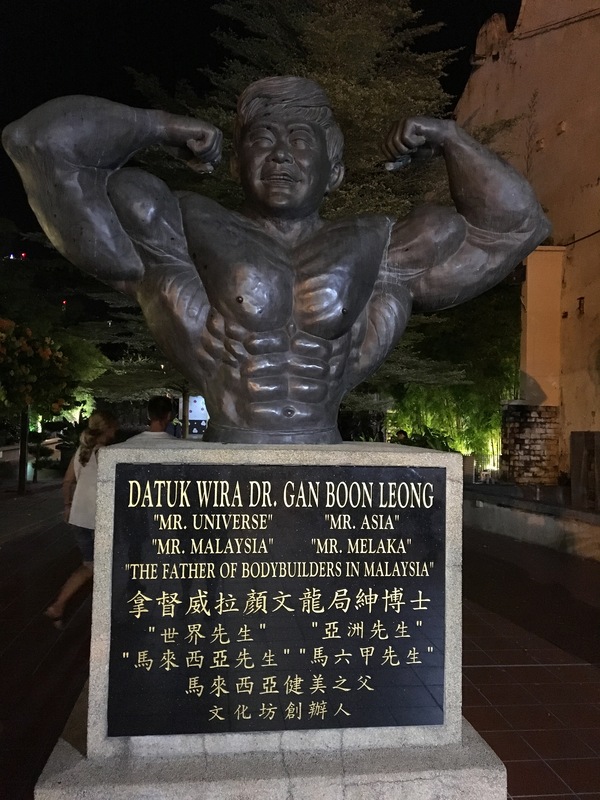 On the way home, we stumbled on the statue of Malaysia’s greatest body builder. In the fresh morning of our last day, we sought out the Kampung Kling mosque in Jalan Tukang Emas, a street of little guest houses and cafes. This is where Melaka finds a lovely balance of old buildings dressed up with a retro aesthetic (think the Ruins Pub in Budapest). When we bought cool drinks in a trendy little cafe, they apologised that they were a ‘no straw’ establishment. In the Kling Mosque with its odd Hindu-influenced manar, a kindly and courteous lady explained to my wife where to find a robe and headscarf. I went to the graveyard, but the stones had been eroded so that the carving was illegible, and they had been preserved by a coat of thick silver paint. A week later, I found a pair of mint condition Melaka gravestones in a Singapore museum. But that’s what you’d expect of Singpore! IF YOU LIKE MY WRITING, WHY NOT TRY MY LATEST NOVEL ‘CAIRO MON AMOUR’. *Campbell, Stuart (2006) “Indonesian/Malay” in Eid, Mushira et al (Eds.) Encyclopedia of Arabic Language and Linguistics. Leiden: Brill, p. 340-345. Campbell, Stuart (1996) “The distribution of –ah/-at forms in Malay loanwords from Arabic” Bijdragen tot de Taal-, Land- en Volkenkunde 152-1, 23-44.